In a series of since-deleted tweets, Roseanne Barr relayed her emotions over the cancellation of her show, explained the chain of events that led to it, and addressed co-stars who had publicly called her out over her actions. Barr was seen publicly for the first time since her show was dropped by ABC executives after an ill-advised tweet comparing former Obama adviser Valerie Jarrett to Planet of the Apes. But Barr had a lot more to say on social media, using her usual eccentric flair in tweeting thoughts on the matter then later deleting them. 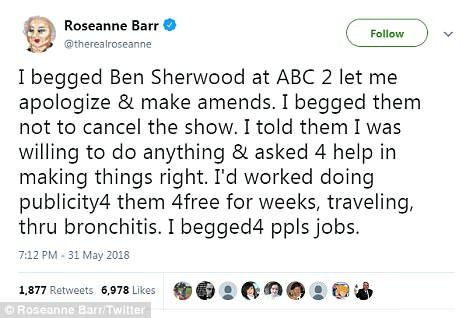 Whatever you think of her comments, it’s quite clear from Barr’s version of events and the fact that the cancellation took place within hours of the controversy, that ABC executives don’t subscribe to forgiveness and second chances. She was going to be fired no matter what she said. Roseanne also took time to address her co-stars Sara Gilbert and Michael Fishman, both of whom publicly commented on the controversy. Barr would end the twitter barrage by stating she would be taking another social media hiatus. “I end by offering everyone involved one more apology and prayers for healing of our divided nation,” she said. Are you upset over Roseanne’s show being canceled? Is there a double standard in Hollywood? Share your thoughts below!